Definition at line 512 of file llsdserialize.h. Definition at line 518 of file llsdserialize.h. Use this inline during construction during a stream operation. str The destination stream for serialized output. 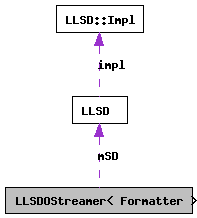 The formatter which will output it's LLSD. Returns the stream passed in after streaming mSD. Definition at line 529 of file llsdserialize.h. Definition at line 539 of file llsdserialize.h. Definition at line 538 of file llsdserialize.h.